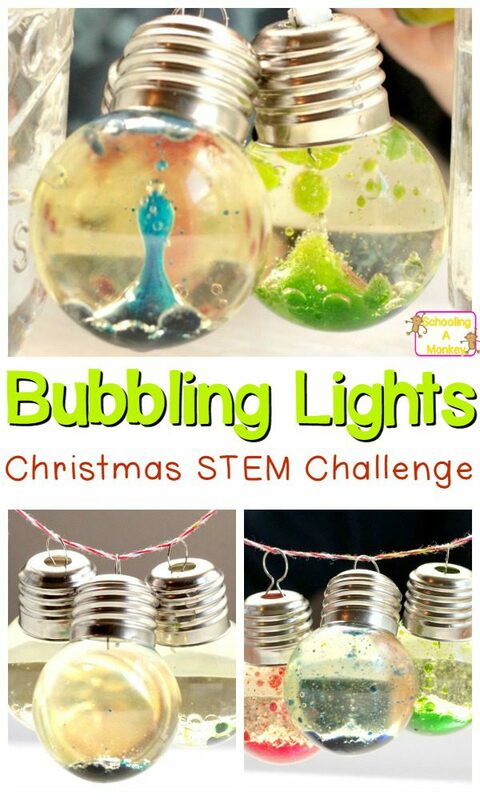 Combine the two and make these Christmas science bubbling Christmas lights for pretty, holiday fun! My in-laws have a string of ancient Christmas lights they break out every Christmas that when heated, cause some sort of liquid to bubble inside a bulb. The lights are so old, they are probably a fire hazard. Still, for as long as we’ve been having Christmas with them, those lights are one of my favorite holiday traditions. 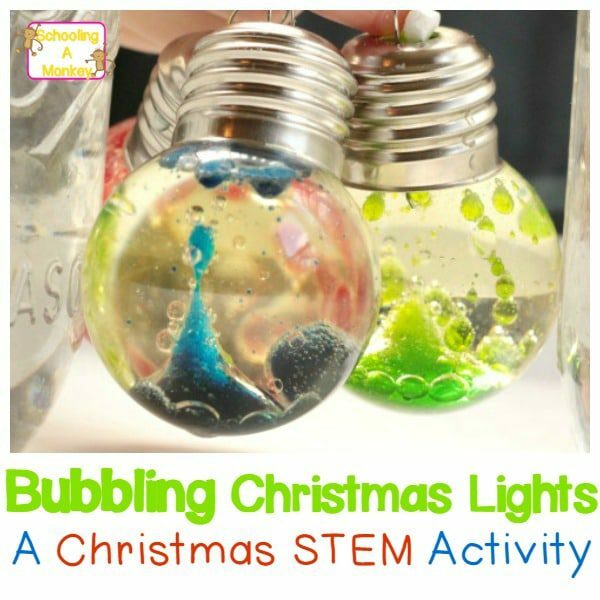 Although I believe you can now purchase new bubble lights that are safer, the lights themselves inspired this Christmas science project. 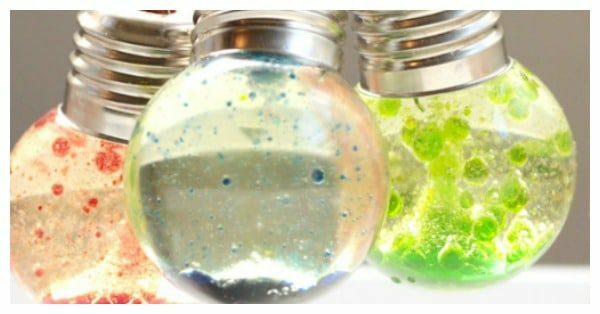 We’ve made alka seltzer lava lamps before, and Monkey predicted that when placed in a Christmas light bulb, the effect would be similar. 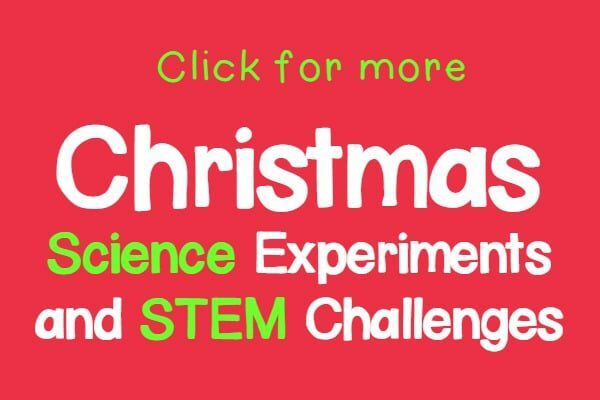 Want to make your own bubbling Christmas science Christmas lights? It just takes a few objects! 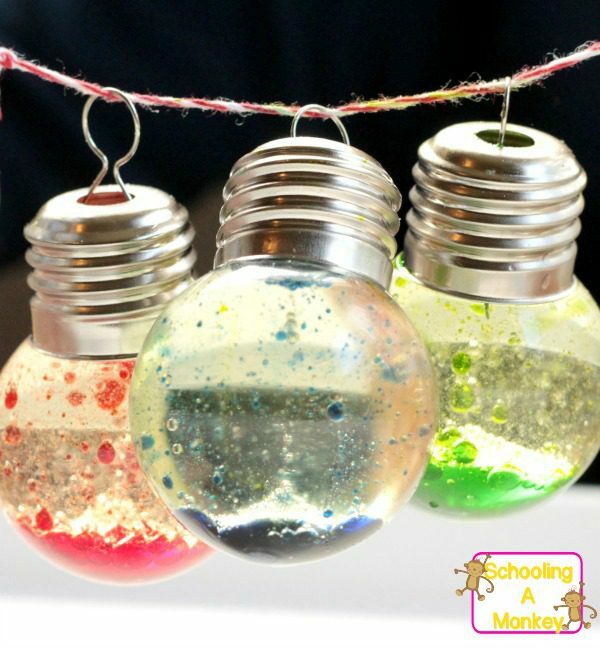 If you don’t want to hang these lights from the Christmas tree (the open tops makes them messy), then you’ll need to set up a lab station like we did. I set out a large tray (we have this one) and tied a string between two mason jars weighted down with water. This created a tight enough string so the Christmas lights could hang from it without tipping over. Fill your Christmas lights about 5/6 of the way full with oil. Fill the rest of the lights with colored water. We used red, blue, and green for our three lights. Hang the filled lights from your tree or your hanging station. Crumble an alka seltzer tablet into small pieces. Slip the pieces one at a time into the Christmas lights. They will start to bubble immedeatly. The more tablet you add to the water, the more violently it will bubble. We were fans of the slower bubble.